Scandinavians – Norwegians, Swedes, Danes, and Finns – all love coffee. 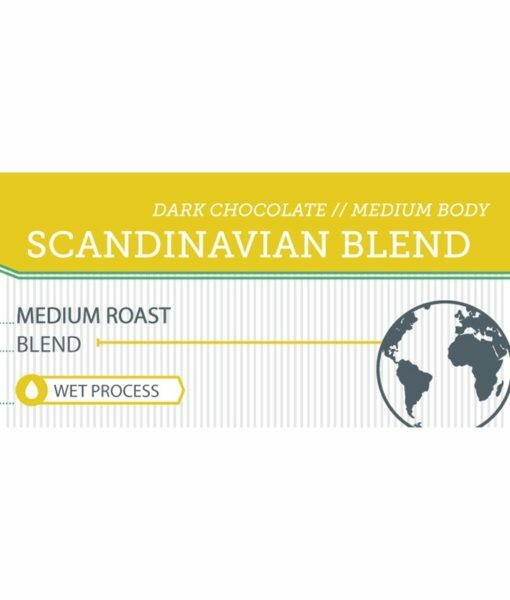 Our Scandinavian blend coffee will invoke images of warm, rustic cottages set against the mountains and lakes of Scandinavia; elk and moose range the countryside while families sit around a log fire. We have chosen to mix highly graded Mexican and Brazilian beans in equal portions to create the warmth this blend requires. Our Mexican Chiapas SHG coffee originates in the southern Sierra Madre mountains in Mexico. Volcanic soil helps the coffee to grow very well, and it contributes a certain brightness to the coffee. The coffee beans are also SHG – strictly high grown – which is the highest grade given to coffee in Mexico. We add Brazilian coffee to balance out the brightness of the Mexican coffee. Brazilian coffee is well-known, both on its own and in blends, for its flavor and good processing. Sweetness from the Brazilian coffee complements the nuttiness and acidity of the Mexican coffee, and the beans are roasted to a medium level to accentuate the deeper, warmer flavor tones of the coffee. The result is a delicious cup that rings with earthy, chocolatey notes and medium body.